I told you it got crazier, didn’t I? That said, I’m really excited about this garden! I love trying new things, and although they could totally flop, it is what keeps the garden exciting. One of the best things about planning for this garden is that I really wanted us to use Indian varieties, not just vegetables that are used in Indian cooking. It’s one thing to say, “They eat cucumbers in India, so let’s just plant any old cucumber variety.” It’s something different to plant a variety from India. So, when I started researching before our committee meeting, I was ecstatic to find a seed company selling Indian varieties in the U.S. – Seeds of India! The vast majority of our plants and seeds will come from them. You can see how it might be possible to have an “Indian” garden that didn’t seem very Indian at all, if we weren’t careful. This is by no means a comprehensive list – there are a number of other things that I didn’t include on the list, in some cases because I wasn’t sure what they were or where to find the seeds. Here’s a good guide to Indian vegetables. Curry Leaf – this is a tropical plant (can’t handle temps below 55!). It is almost like the bay leaf of Indian cuisine. A lot of traditional curry recipes call for curry leaf, so I’m excited to try growing it as an annual. Cumin – This plant grows a lot like dill, with the umbels of flowers (pink!) that then produce seeds. ‘Kesar’ Carrot – This carrot is red, high in lycopene, and the Days to Maturity was listed at 120 days. We decided to plant some of the ‘Samurai Red’ carrots (60 days) as well, just in case the ‘Kesar’ variety doesn’t make it through the hot summer. We may plant a second crop of carrots in the fall. ‘Dulhan’ pepper is shaped like a tomato and is supposed to taste like a sweet pepper but with a hint of heat. ‘Jwala’ is a hot pepper that is reputed to be the most popular hot pepper in India. It looks a lot like a cayenne pepper to me, but it’s hard to tell until you can compare side by side. On the first trellis we will have edible gourds – one snake gourd and one bitter gourd (aka bitter melon). ‘King Cobra’ snake gourd is supposed to have long, white speckled fruit that look like snakes. The gourd is low in calories and can be cooked in a variety of ways. ‘Tagore’ bitter gourd (or bitter melon) is an Indian-type gourd with a mild bitter flavor and more rounded tubercles, compared to some of the more pointed types. For the cucumbers, we chose ‘Poona Kheera’ (aka Puneri) and ‘Sambar.’ Poona Kheera is a salad cucumber that is white when young and turns russetty brown as it gets bigger. It is supposed to thrive in hot, arid climates. (Watch us be cool and wet this year!) ‘Sambar’ is listed as a cooking type cucumber for use in curries and stews. It is yellow with brown blotches on the skin. Underneath the two trellises, we will plant the ‘Sagar’ spinach and ‘Basanti’ mustard greens. I have no idea if they will be different in any way from other spinach and mustard greens, but we’ll find out! 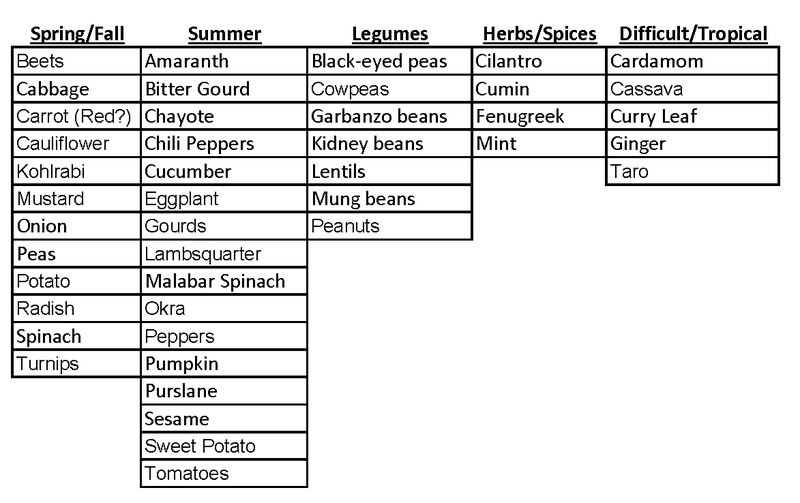 Legumes are a staple of Indian food, and so we wanted to try growing some, even though we don’t have enough space to get a great yield. The ‘Black Kabouli’ chickpeas have black/dark purple seed coats, rather than the typical brown. Black hummus, anyone? Chickpeas typically like slightly cooler summers, so I don’t know how well they will do here. Cowpeas are a traditional Southern vegetable, although the Green cowpeas are an Indian variety. Cowpeas typically do fine here. All told, this garden could be spectacular and exciting or a source of a lot of stress this summer! Posted on January 29, 2014, in Garden Planning and tagged asian garden, Asian vegetables, beans, garden planning, garden plans, gourds, Indian garden, Indian vegetables, legumes, vegetables. Bookmark the permalink. Leave a comment.